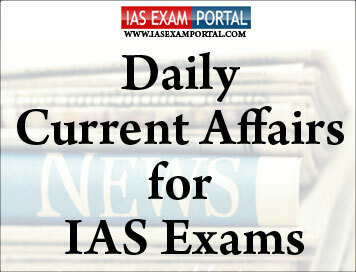 Current Affairs for IAS Exams - 27 August 2018 | IAS EXAM PORTAL - India's Largest Community for UPSC Exam Aspirants. Prime Minister NarendraModi on Sunday declared that the whole country was supportive of Kerala as it faced its worst floods in 90 years. The State government has been demanding more Central assistance as it faces the daunting task of rehabilitation and reconstruction after rescue operations have been completed. Disasters, unfortunately leave behind a trail of destruction. But one gets to witness facets of humanity, humaneness during disasters. From Kutch to Kamrup, from Kashmir to Kanniyakumari, everyone is endeavouring to contribute in some way or the other so that wherever a disaster strikes, be it Kerala or any other part of India, human life returns to normalcy,” he added. Mr.Modi through his mannkibaat also spoke of Vajpayee’s contribution to good governance by bringing in the 91st Constitution Amendment, 2003, which limited the size of the Union and the State Ministries to 15% of the strength of the Assembly, and changed the anti-defection law to allow only two-thirds of the legislators of a party, instead of the earlier one-third, to form a separate group without being disqualified by the Speaker. He also congratulated all those who won medals at the ongoing Asian games, and highlighted the fact that medals were being won in sports in which India had no traditional dominance and by younger athletes and those hailing from small towns. As Kerala grapples with the aftermath of unprecedented rains and inundation, Secretary, Ministry of Earth Sciences M.Rajeevanexplaines the challenges of forecasting floods in the State with relatively small rivers prone to flash floods, inaction at the local level despite weather alerts and dam management. In Kerala the rivers are relatively small. For instance, if it rains in a hilly region, it can flood within 25 minutes and in an hour the water will come. Rivers like Cauvery and Narmada have huge basins and such inundations are much slower. The IMD has 11 flood warning offices such as in Ahmedabad, Bhubaneshwar etc.. They interact with the CWC everyday during the monsoon. Every river is divided into basins and we give a two to three day forecast for each basin and we give a quantity — the average rainfall over the basin and how much is likely — and IMD runs them in weather models to generate a forecast. This is given to the CWC and they in turn use it to estimate how much water is likely in a river. Dams are managed by States and they worry about their own personal requirements such as, hydro-power management. The dam managers should know that (in the case of Kerala this year) it’s July, the dams are full, there are two months of monsoon left. Decisions should be made by talking to the meteorological office, factoring inputs and there’s no such mechanism in place. The southern and interior part won’t get much rain. The west coast however will still see rain — Karnataka, Maharashtra but not really Kerala and the worst is over for Kerala. Public sector banks are in the process of closing or rationalising about 70 overseas operations as part of capital conservation exercise. According to the data, 159 branches of PSBs are operating in foreign countries of which 41 branches made losses in 2016-17. The country’s largest lender State Bank of India (SBI) led the pack with nine of its overseas branches in the red. It was followed by Bank of India and Bank of Baroda with eight and seven branches, respectively. SBI had the largest number of overseas branches (52) followed by Bank of Baroda (50) and Bank of India (29). PSBs have the largest number of branches in the U.K. (32) followed by Hong Kong and the UAE (13 each) and Singapore (12). The government will soon make it mandatory for unlisted companies to issue new shares only in the dematerialised form, senior officials said, amid intensified efforts to fight the black money menace. Besides, the unlisted corporates would have to ensure that shares are transferred only in dematerialised (demat) or electronic form. Initially, these regulatory requirements, expected to be effective from the first week of October, would cover more than 70,000 public companies, two senior government officials told PTI. With respect to issuance of bonus shares and stock split also, the entities would have to issue them in the demat form, they added. The proposed move would help in enhancing transparency in ownership at corporates, curb benami transactions and bolster the efforts to weed out shell companies that are allegedly used for illicit activities, they said. They have been asked to keep costs at a minimum for conversion of shares from physical form to dematerialised form by the unlisted companies, the official added. At present, listed companies need to have shares in electronic form but it is not compulsory. The 8th meeting of India-Kenya Joint Trade Committee was held in Nairobi, Kenya, from 22nd – 25th August, 2018. The discussions during the meetings covered India’s contribution in implementation of Kenya’s Big Four Agenda – food security, affordable housing, universal healthcare and manufacturing, expansion and diversification of bilateral trade. Kenya’s readiness to join the International Solar Alliance, implementation of Lines of Credit, of over US$ 220 million, extended by Government of India in power transmission, SMEs development, agricultural mechanization, implementation of decisions taken during the high level exchanges, cooperation in health, blue economy, agro-processing sectors and WTO related issues; and training & capacity building programmes offered by India. In his address to the Kenyan and Indian business leaders, Suresh Prabhu emphasized on research and design in products specific to Kenyan needs and urged Indian businesses to carry out a market study to identify priority areas for bilateral cooperation. EmmersonMnangagwa was officially sworn in as President of Zimbabwe on Sunday after winning a bitterly-contested election which was the country’s first since the ousting of strongman Robert Mugabe. Mr.Mnangagwa, whose victory in the July 30 polls was challenged by the main Opposition, pledged to “protect and promote the rights of Zimbabweans” at an inauguration ceremony attended by thousands of supporters at a stadium in Harare. He also vowed to open a probe into the post-election violence, which he called “regrettable and most unacceptable”. The Army’s firing on protesters killed six shortly after the election. The country’s top court on Friday dismissed Opposition leader Nelson Chamisa’s bid to have the results annulled on grounds they were rigged. But Mr.Chamisa rejected that ruling and vowed to lead “peaceful protests”. Mr.Mnangagwa has sought to turn the page on the issue, calling for “peace and unity” in a televised address after the court decision. Products like wipes and tampons are also clogging sewer systems, resulting in billions of dollars in maintenance and repair costs. Unfortunately, the natural water bodies these get into do not have the heat or micro-organism levels to effectively degrade these,” he added. “That is why we see rayon accumulating in the oceans. While toilet paper will break down in anywhere from a minute to four minutes, wipes take at least six hours to disintegrate, Mr.Villée said. Furthermore, the pumps at collection systems that move waste downstream to treatment plants cannot tear them apart. Waste water treatment plants are not designed to filter out pharmaceuticals, so drugs that are disposed of in the toilet or the sink drain end up entering streams, rivers and lakes. A study conducted by the U.S. Geological Survey found prescription and nonprescription drugs and hormones in 139 streams across the U.S. during 1999 and 2000. An Indian Army contingent beat its Pakistani counterpart in the final of a friendly volleyball match organised on Sunday on the sidelines of a mega anti-terror drill being held in Russia. An Army officer said the team of 5 Rajput Regiment emerged winners among the eight participating nations, he said. Around 200 Army and Air Force personnel from India are participating in the anti-terror drill.